Rhubarb is here, rhubarb is here! I have to say Spring, and all of your beautiful food, I adore you. I struggled through the end of winter feeling completely unmotivated in the kitchen. Now, with all of this asparagus, bright greens, and hot pink rhubarb, I am overly excited about the new possibilities. And although the cost for rhubarb is a little high, with it still being early in the season, I couldn't help but buy a small bundle. To me, rhubarb use to be this ingredient that I thought of only for your pies, crumbles, crisps, normally being tossed in with some strawberries. Those are all good options, very good options really. But the truth is, I prefer it more simply. Using few ingredients that help bring out the flavors of the rhubarb, and not hiding it by tossing with mounds of sugar, flour, butter, etc. This recipe is simple, rhubarb roasted with a bit of sugar, some vanilla if you like, and a little rose' wine. Put in the oven until just tender and served over yogurt. And if you by chance have some scones or biscuits around, put that in the bowl too. With any leftovers, simply mash together the roasted rhubarb with the rose' rhubarb sauce in the pan. Then strain, and mix this liquid with vodka and soda. Rhubarb Vodka Soda, the perfect spring cocktail! Preheat oven to 350 degrees. 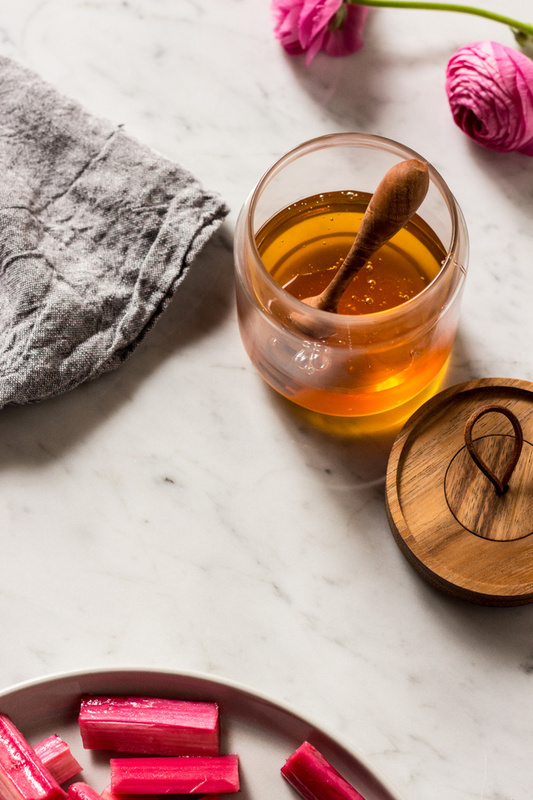 In a large baking pan, combine 1/2 cup sugar, wine and vanilla. Stir until the sugar dissolves. Add the cut rhubarb and toss together. Cover with foil and roast for 15 minutes. Remove the foil and roast for another 5-10 minutes until the rhubarb is tender. Trying to avoid letting the rhubarb cook too long that it becomes mushy. 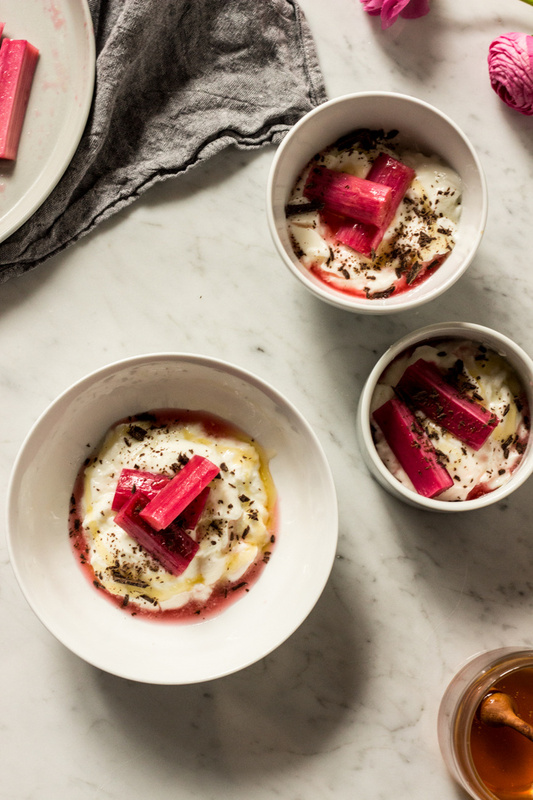 Fill serving bowls with a large scoop of greek yogurt, drizzle of honey, shaved dark chocolate and roasted rhubarb. Make sure to scoop some of the rhubarb rose sauce from the bottom of the pan over top. Breakfast or dessert, either way!